Try your luck and fill up your sleigh with Rudolph the red nose Reindeer and Santa and see what you can put in your stocking with a wild or a scatter icon, or a Free Spin Bonus game. 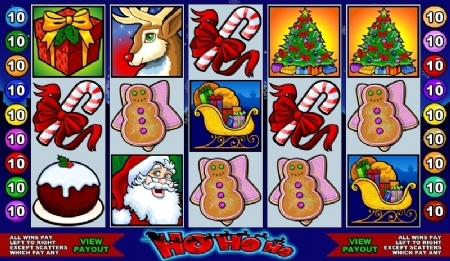 Fill you're stocking with the festive spirit of the Ho Ho Ho online video slot game where you are surrounded with delicious icons such as the well known friendly Rudolph the red nose reindeer, the festive fruit cake and sugar cookies and many more. Plus a Gamble Bonus Game where you can stand a chance to win up to 15 000 coins in the normal game but by having 3 or more Christmas Gift icons on the reels you stand a chance by winning the outstanding Jackpot of $150 thousand! There are 15 pay-lines in this amazing slot.